How to clear all controls values in web page? For an example we are create Registration page in our project in that time we placed lots of controls like textbox, drop down list, check box and radio button etc. If user click that clear button we need to clear all controls values, without writing line by line code use this simple code to clear all values in single click event. 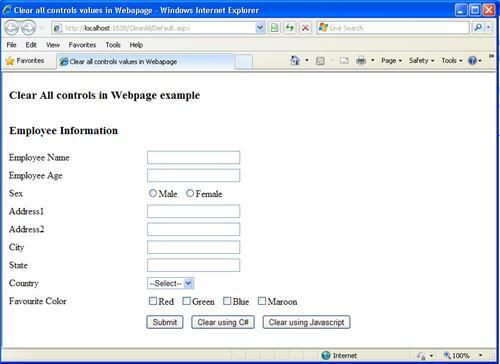 I have places some controls in client side of the web page and look like this image . We can clear these controls values in the two ways. &LT;asp:Button ID="btnClear" runat="server" Text="Clear using C#"
I have attached source code please download it and try it to clear all control values. Thanks a bunch. I was looking for something similar to check about 86 RadioButtonList on the page for checked values and this code has solved the issue.